The whole process of buying a new kitchen is quite a big undertaking and it’s important that you feel happy with the company you choose. You can buy a new kitchen from a range of providers from a local joiner who dabbles in kitchens through to a national (or even international) chain of kitchen/furniture suppliers, so choice is huge. This is great in terms of range of style and quality available and it makes the market very competitive but too much choice can also be quite daunting and makes the job of finding a supplier that you like, quite difficult. Choosing a kitchen can be time consuming anyway: finding a style you like; thinking about materials and colours; playing around with space and layout etc. Shopping around is important, especially for such a big investment, but you don’t have time to meet with unlimited kitchen companies so choose your shortlist wisely. To help you do this it’s a good idea to find out a bit about how these companies operate because it’s not just about the kitchens they sell, it’s how they sell them. Here’s a little insight into how we like to run our business (and how we don’t!). Showroom or no showroom (or something in between)? Many larger companies will have their own showroom which is great for browsing and seeing the kitchens ‘in the flesh’, in fact there’s no substitution for getting a real feel for the materials and colours. However, showrooms don’t come cheap. Premises, display stock and staff all come at a hefty price and that price has to be passed on to the customer. We choose not to have a showroom of our own here in Wakefield, mainly because of the way we would have to inflate the price for our customers. We are, however, not showroom-less because our supplier, Daval Furniture, does have a showroom at their factory, just down the road in Huddersfield. It means that our customers can still go and get that tactile experience without shouldering the increase in costs. We’re more than happy to go meet you there and take you round. When we go out to our customers’ homes to show them what we can do, we very much think of that as a design consultation. Sadly, many of our competitors think of them more as a sales opportunity and there’s a great deal more selling than designing. 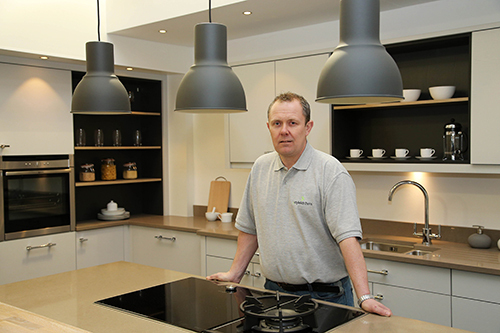 Our MD, Dean Clements, came into this industry as a kitchen designer/fitter who also has to sell, whereas many employed by kitchen companies are sales people who’ve had to learn to design. Don’t get us wrong, we want to work with you and we hope that you’re impressed enough by what you see that you’ll choose us to buy your kitchen from, but we never go for hard selling techniques and our designs are provided free of charge without obligation. Trust us, you should not be buying anything from someone who will only honour that price there and then (especially those that pull the old ‘phone call to their manager’ trick to secure you an extra special price). A new kitchen is too significant a purchase to make snap decisions. We believe that our designs and our prices stand up against anyone’s so we’re not afraid to let you shop around. We pride ourselves on offering a complete service; we can deal with all the trades and jobs that go along with a kitchen re-fit – electrical, gas, plumbing, tiling, plastering, flooring etc – but we don’t have to. If you’d rather use your own people, that’s not a problem. If you want the different costs itemising on your quote, we can do that too. We aim to be as transparent as possible. Some kitchen companies will insist on handling everything and it often comes as one big quote so you don’t really know where your money is going. Some small outfits don’t have the resources to offer any more than a basic kitchen fit and that can be a problem for those who don’t want to manage a number of tradespeople. At the end of the day, it is our job to make buying a kitchen as stress-free and flexible as it can be and that means tailoring what we do to what the customer wants, not the other way round. Really, the best way to measure any kind of company is to ask those who have already worked with them what they think. We get a lot of our work from recommendation and the comments that we get show us that we must be doing something right! We find that this approach works well for us and we wouldn’t want to be doing business any other way. If you are looking for an honest kitchen company who puts the customer first then we’d be delighted to make your shortlist. Contact us to arrange your design consultation (not sales meeting!) now. 0 Responses to "Buying a Kitchen, 3Style "